Ratatouille is a French side dish, but is also served as a complete meal in lunch or dinner. It can be served with rice, pasta, bread or used as a filling in crepes. Add bell pepper, cayenne pepper, salt, black pepper, oegano and cook for 5-7 more minutes. Take a bowl. Add all dry ingredients and butter and mix it. Slowly add milk and whisk it properly so that lumps are not created. Take a pan and heat it. Add 2-3 drops of oil and brush it. Pour a ladle of batter in the center of pan and spread it evenly to make a thin crepe. Cook one side till it is light brown and then flip it over on the other side and cook it. Take about 2 tablespoon of ratatouille and spread it on the half crepe. Fold it into half to make a half moon shape. 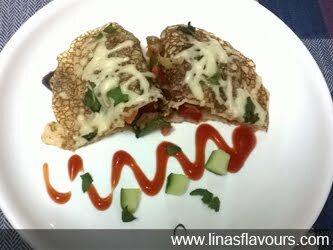 Sprinkle cheese and basil leaves on the top of the crepe and cook it for a minute, till cheese melts. Note: You can prepare crepes in advance and before serving arrange all crepes in a plate, sprinkle cheese and basil leaves and warm it in microwave.